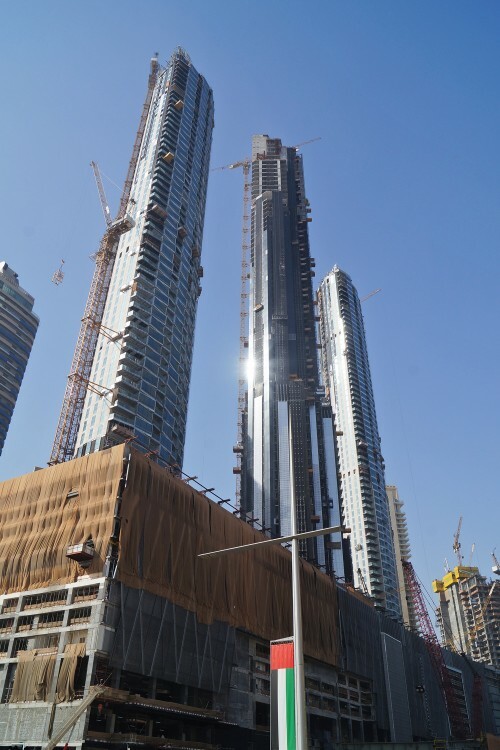 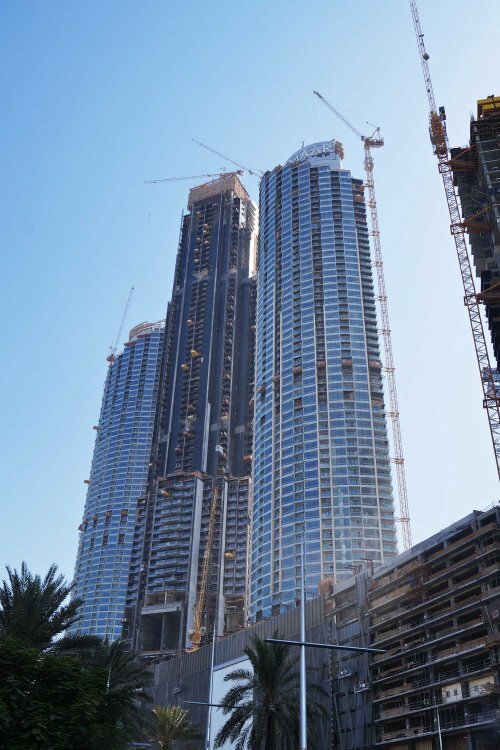 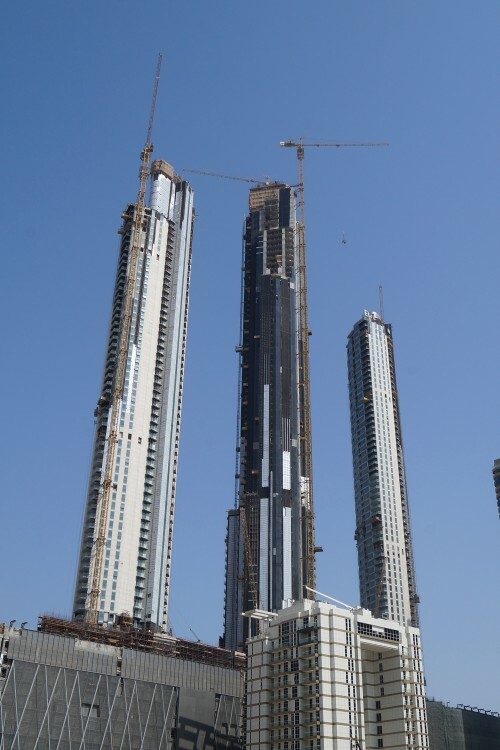 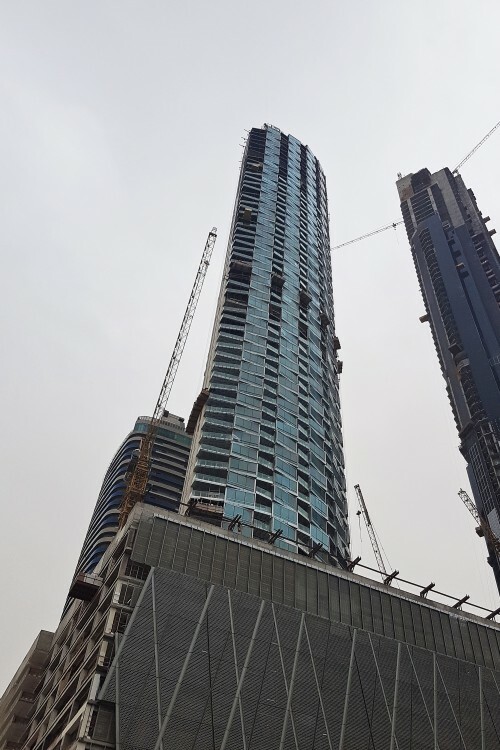 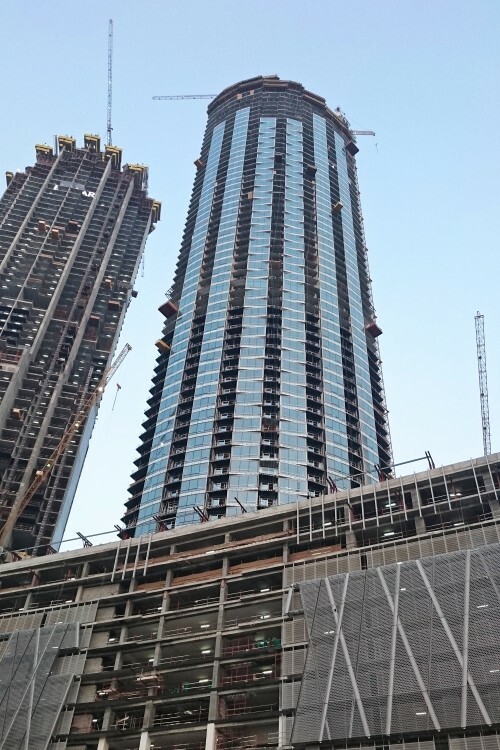 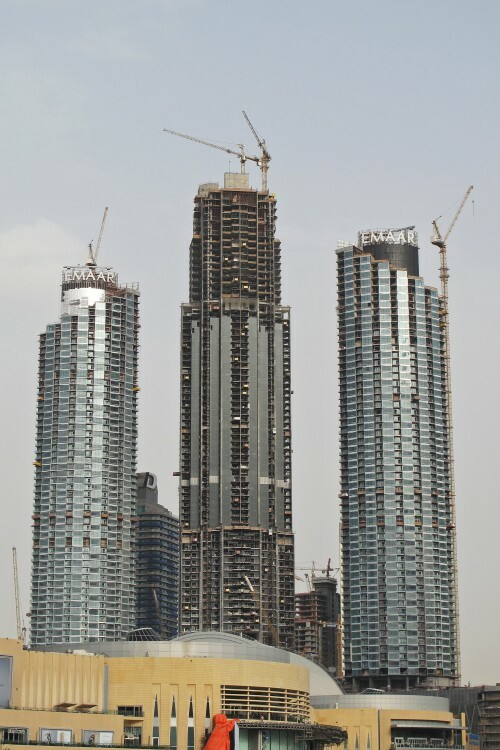 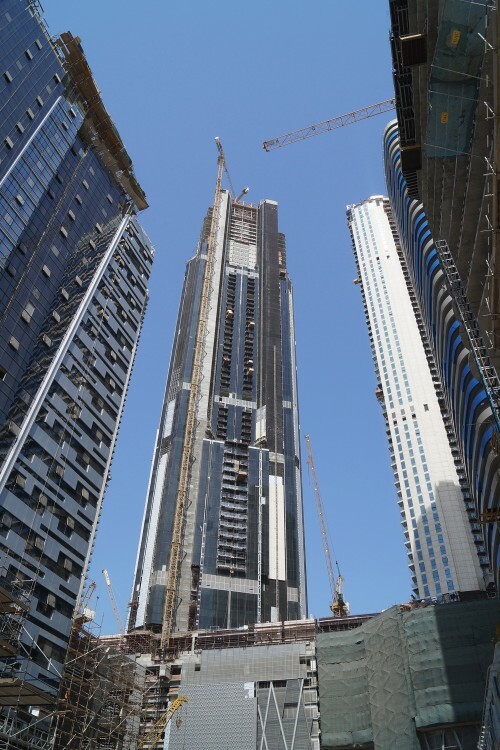 The Address Residences Fountain Views, presently under construction, was launched in 2013 and is to be the first dedicated serviced residence complex in the Downtown Dubai. 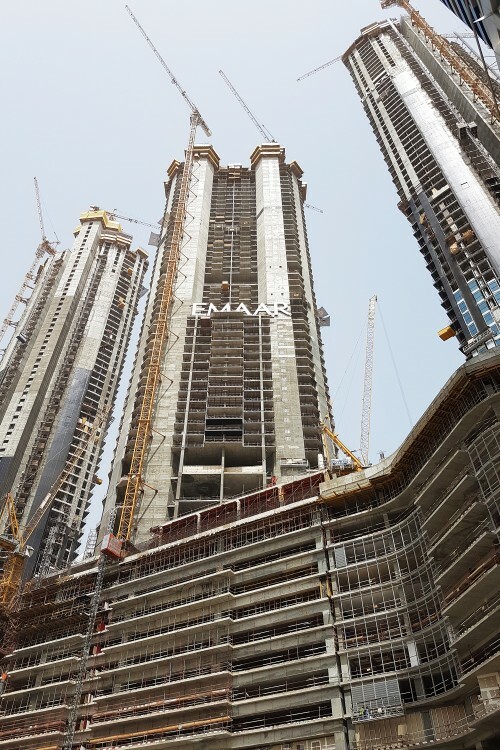 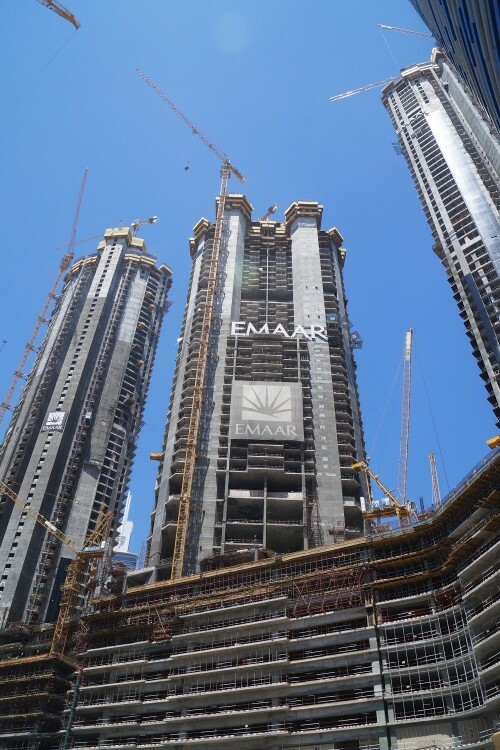 This is an Emaar development designed by Dewan Architects & Engineers with WME. 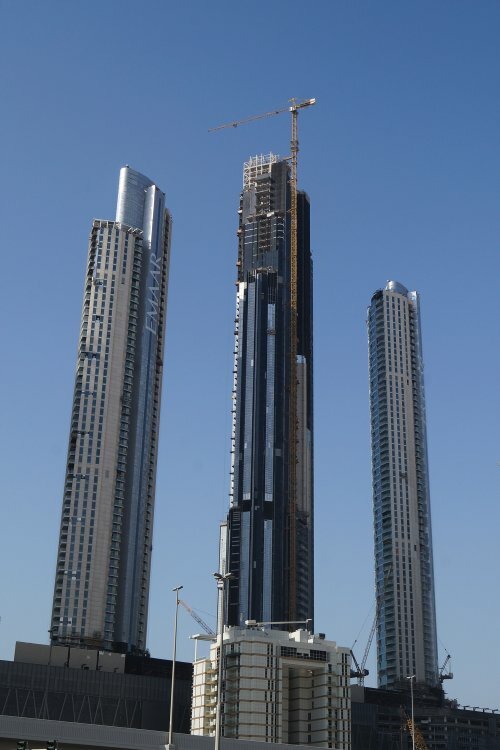 The three-tower complex overlooks Burj Khalifa and The Dubai Fountain. 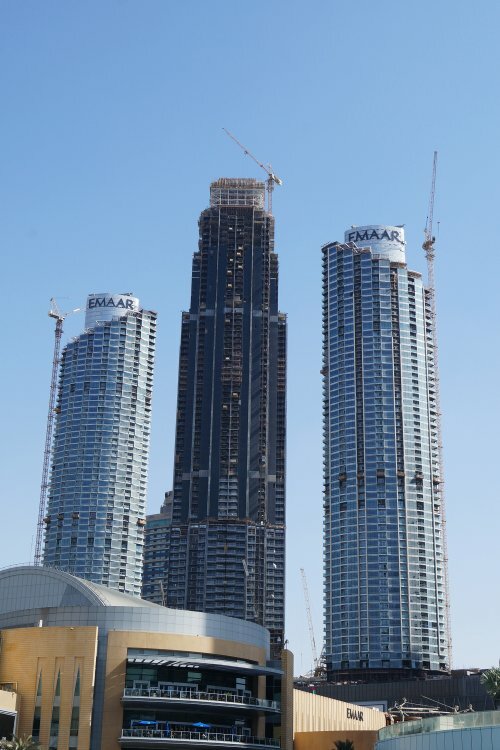 Towers 1 and 3 each have 59 floors and Tower 2 has 65 floors. 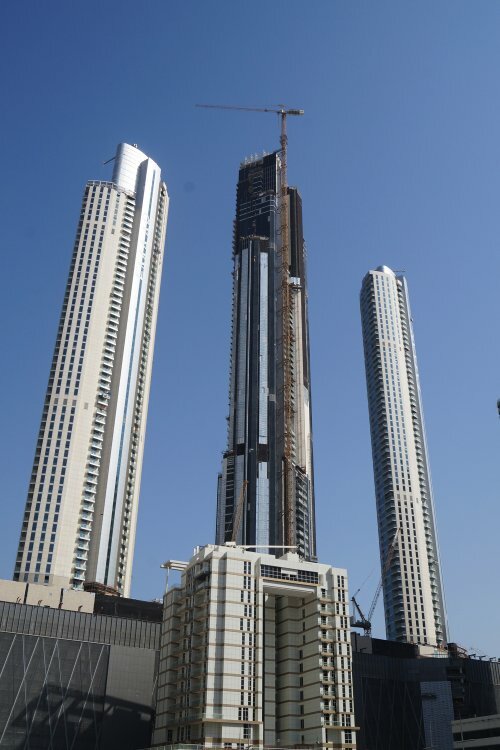 Altogether there are 786 serviced apartments ranging from one to four bedrooms as well as duplex apartments and penthouses. 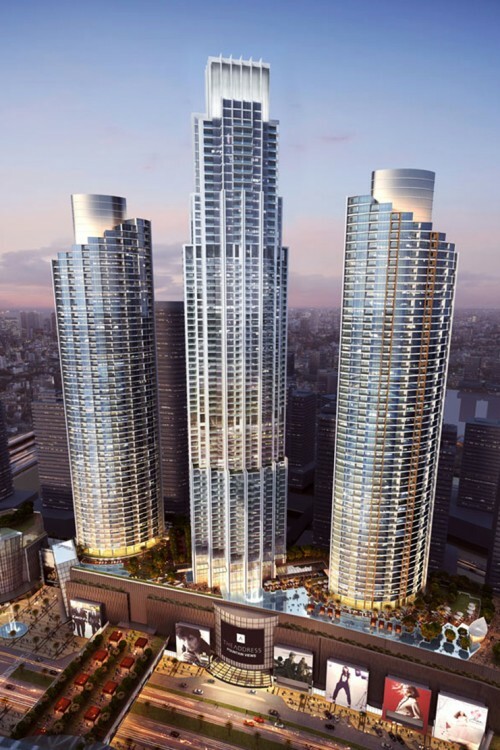 A new Address Hotel has 194 rooms. 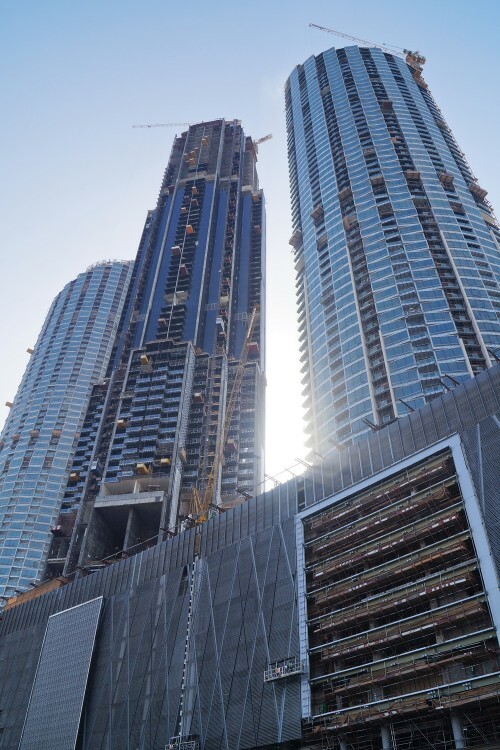 Amenities will include a fully equipped health club and a rooftop recreation deck with landscaped amenities and water features. 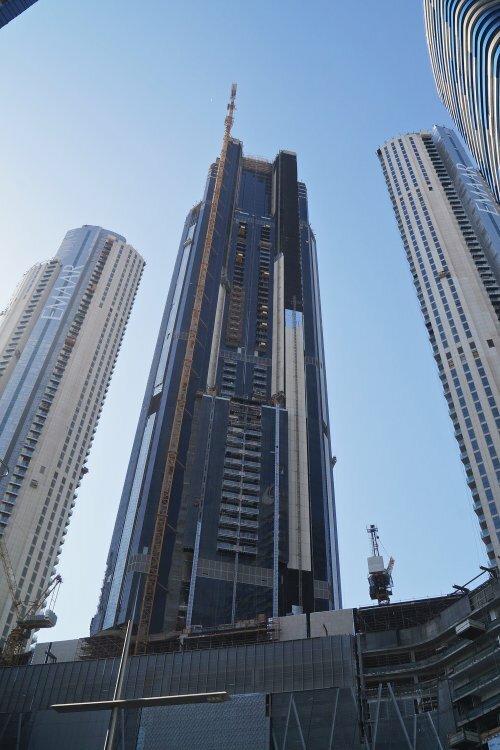 The swimming pools cater for lap and family swimming plus wet-deck lounging. 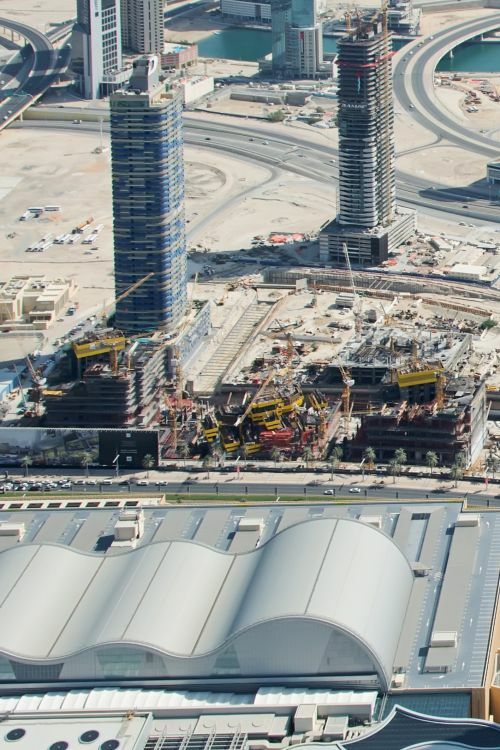 The children’s play zone includes a shaded children’s pool. 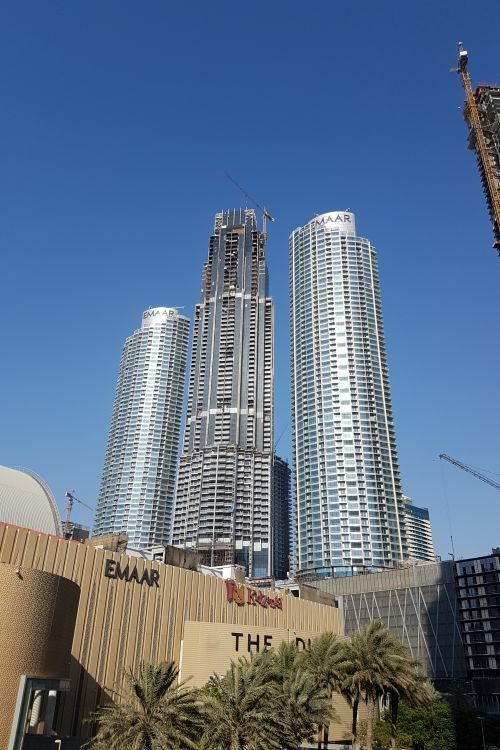 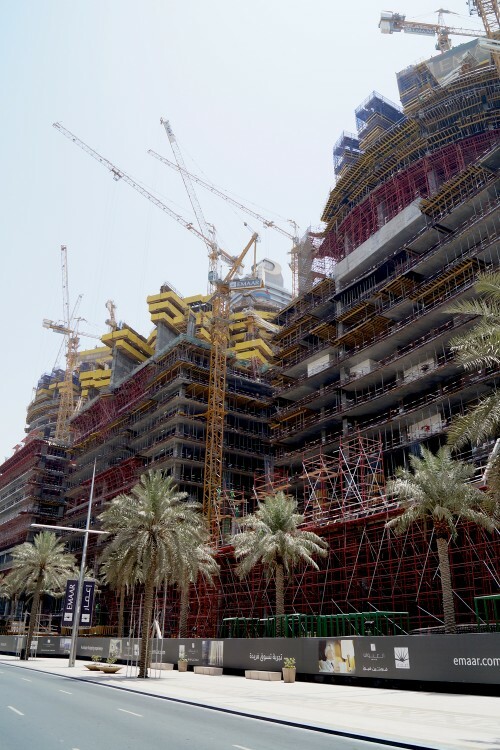 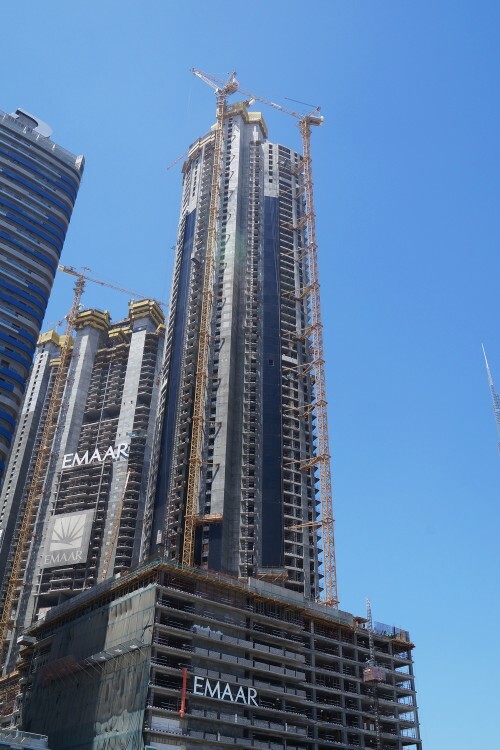 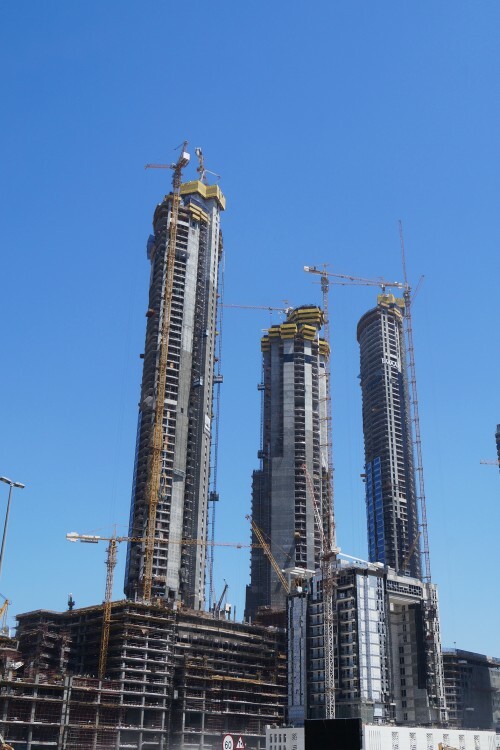 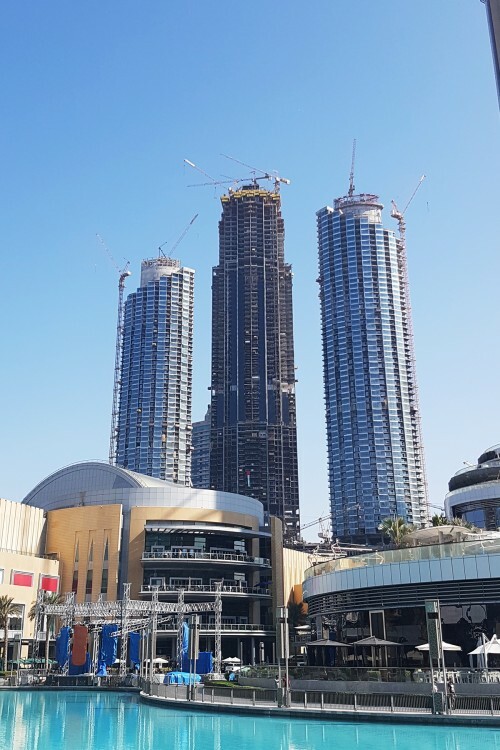 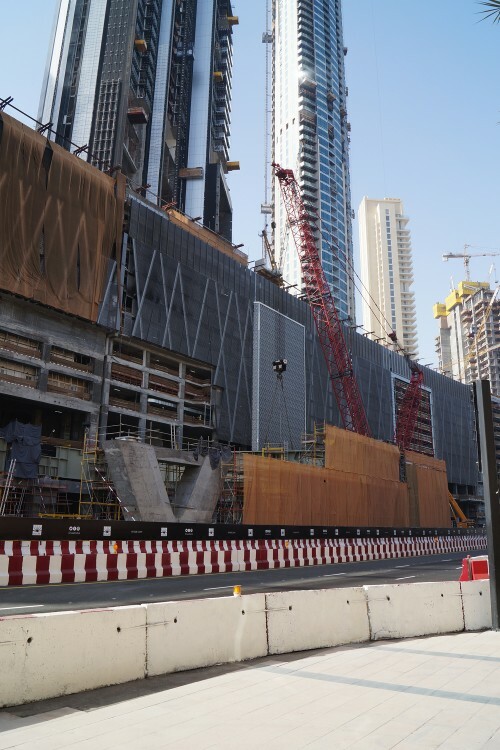 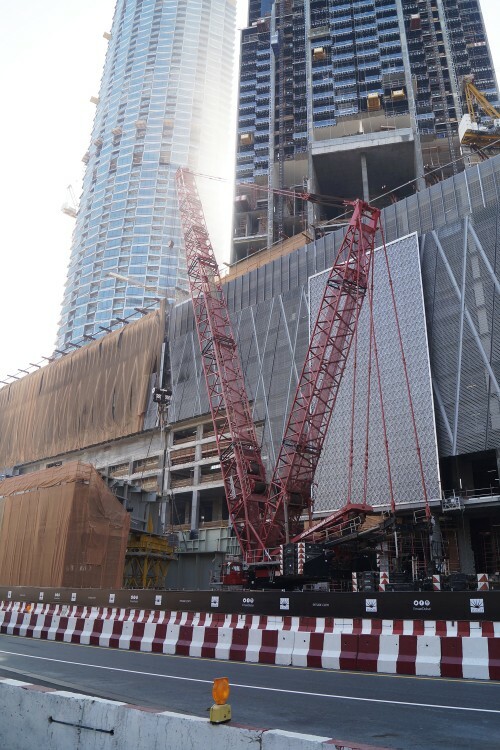 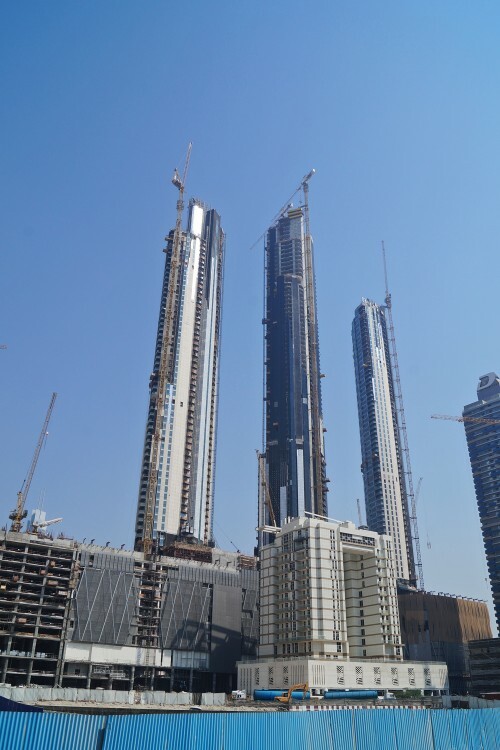 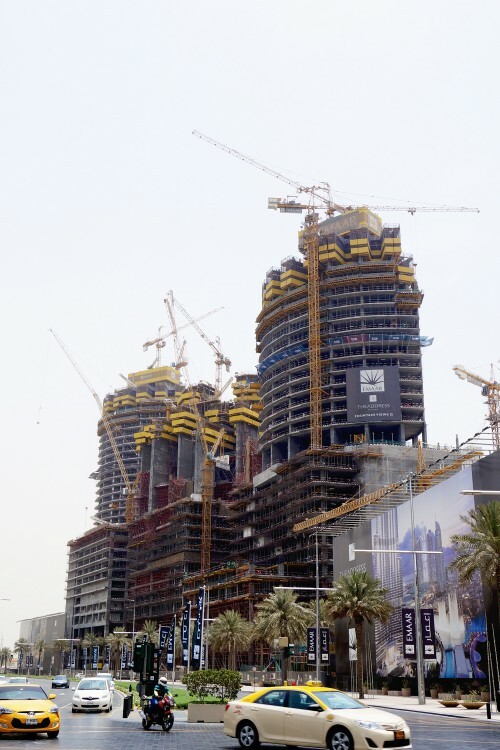 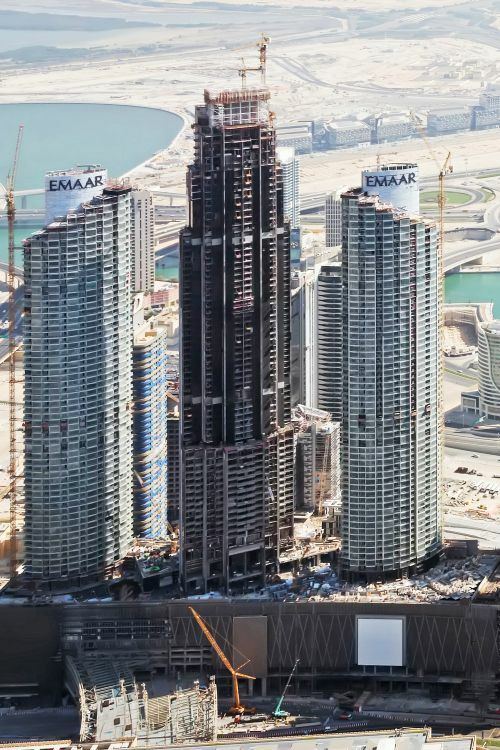 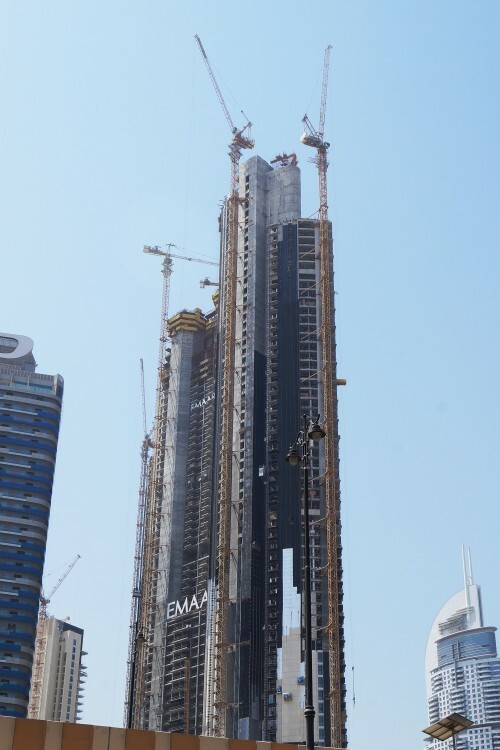 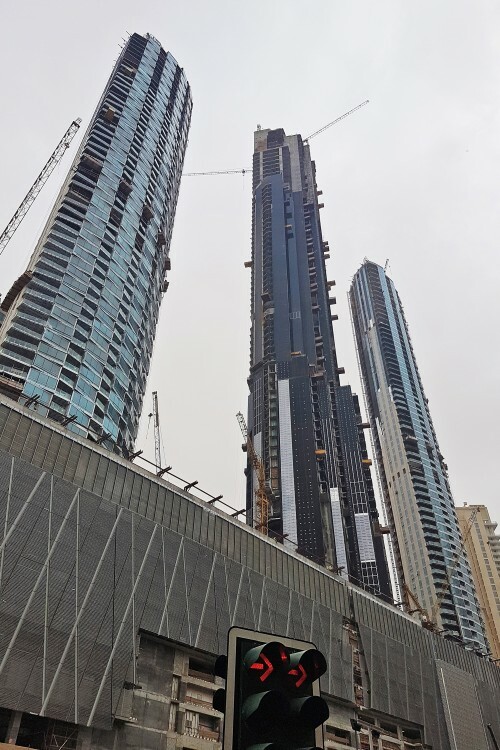 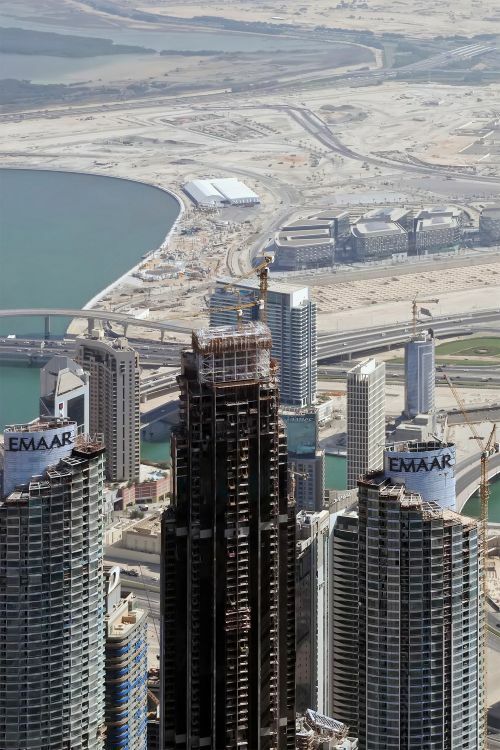 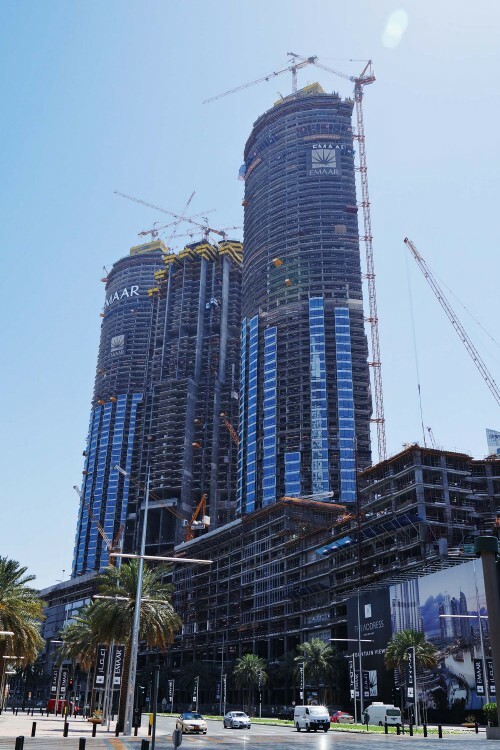 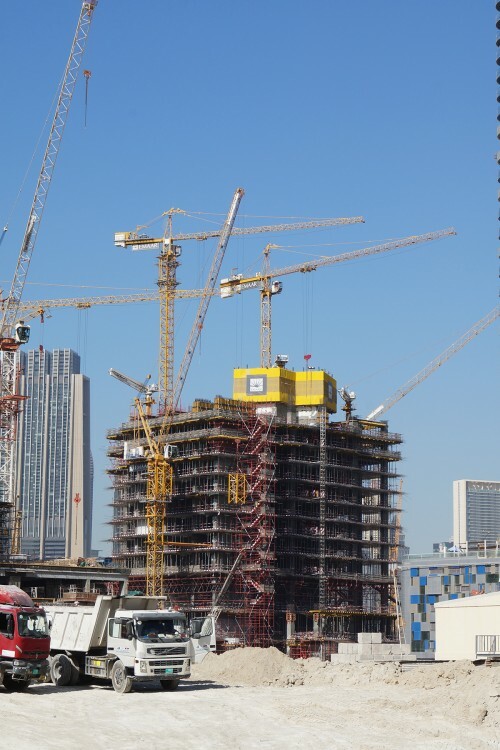 The towers are being built over a 15 storey mixed use podium comprising retail and parking levels together with a link bridge connection to the adjacent Dubai Mall. 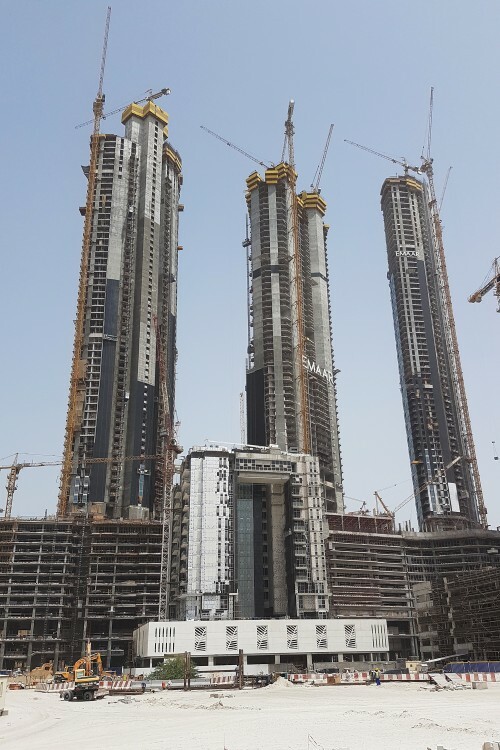 Scheduled completion dates for towers 1 to 3: July 2017, September 2017 and April 2018 respectively. 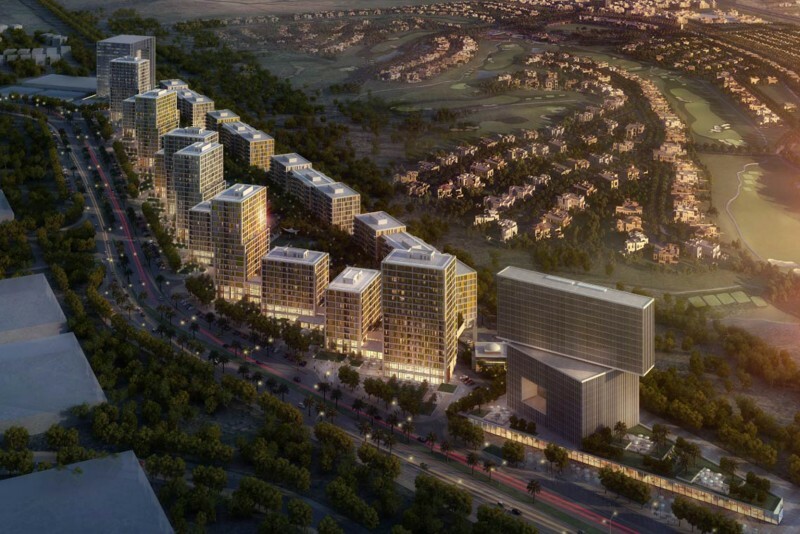 One-click links to properties currently on the market in The Address Residence Fountain Views. 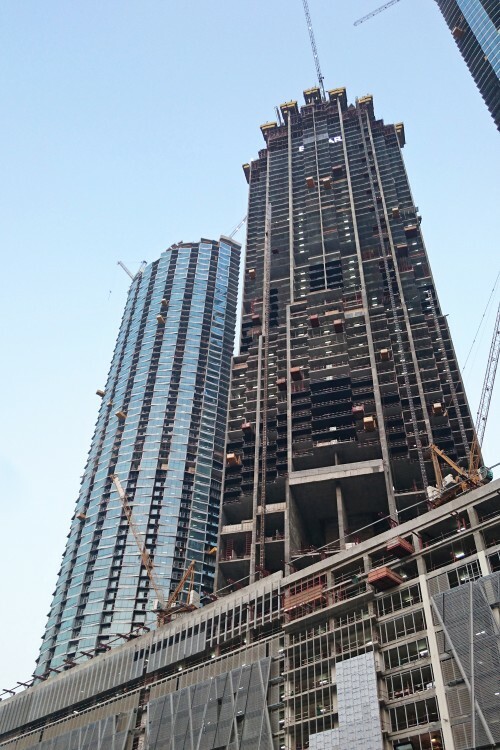 Quarter 4 2016 status Fountain Views II: the project is moving at a very promising pace with reasonable certainty that it will be concluded on time; tower concrete is complete; tower tiling is ongoing on L14 to L32; tower curtain wall is ongoing, tower block work is ongoing on L13 & L29 to L70; tower screed, drywall, ceiling closures, and MEP in progress; podium slabs have been poured up to P12, podium block work is ongoing on B3 to P12; podium façade, screed, painting and MEP is in progress. 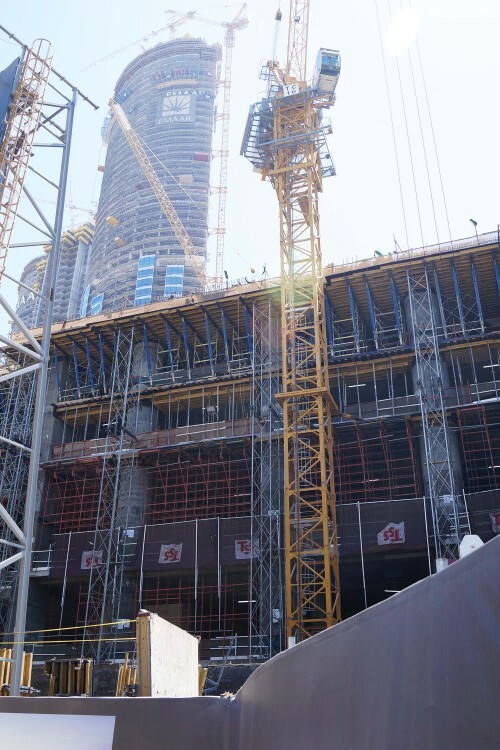 Quarter 4 2016 status Fountain Views III: the project has been making good progress despite many of the technical intricacies involved; tower core walls have been completed up to Level LR and partially poured to Level UR; tower shear walls have been completed up to Level 77 and partially poured to Level LR; tower slabs have been completed up to Level 77 and partially poured to Level LR; tower finishing, MEP and facade works are ongoing; tower block work is in progress on L12 to L28 & L30 to L61 & L64 to L65. 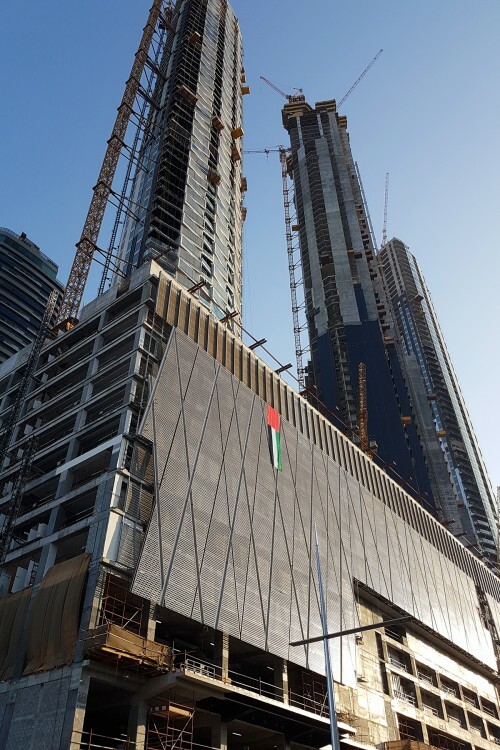 Quarter 4 2016 status Fountain Views I: the project has been progressing commendably; tower concrete is complete; tower blockwork is complete on L16 to L32 and ongoing on L13 to L15, L33 to roof; tower screed is complete on L16 and ongoing on L13 to L32 , L34 to L54, L56 to L57, L59 to L60 & L63, L66; tiling and curtain wall in progress; podium block work is ongoing on B3 & B2 and ongoing on B1 to P10; podium façade, painting, ID works and MEP is in progress.